Grand Hotel de Clermont, Paryż, Francja : Rezerwuj teraz! Located in the heart of historical Montmartre, Le Grand Hotel de Clermont offers doubles and triple rooms with private bathrooms. Our bedrooms are now equipped with a hairdryer. On the ground floor, the world renowned Cafe Chez Ammad with more than a century of history, is still a meeting point for international artists and philosophers. 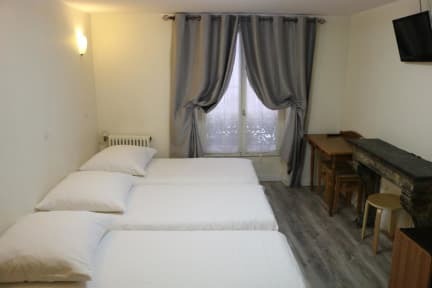 The hotel is located less than 200 meter from Abbesses, Pigalle and Blanche metro stations. A free high-speed Wi-Fi is available thoughout the Hotel. If there were any mistakes on your reservation at the Ritz, or if the Lutecia restaurant is overbooked, you can always count on coming to Cafe Chez Ammad, at the end of avenue Veron. In 1929, Edith Piaf took here, her first room at the Grand Hotel of Clermont at the tender age of only 14 years old. 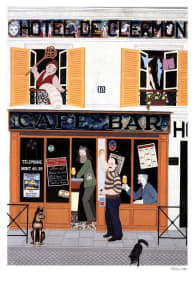 She made this place her nest in Montmartre, as she made her first steps as a street singer in Pigalle and Menilmontant, where she earned her nickname 'Piaf'. - From 48 hours the total amount will be took. The payment is took when you book. Please note our hotel does not have a lift.